WEST WINDSOR – Prospective students, their parents, and adults interested in enhancing their job skills will have a chance to learn more about what Mercer County Community College (MCCC) has to offer during the Explore Mercer Open House, Wednesday, April 13, from 6 to 8 p.m. at the West Windsor campus Student Center, 1200 Old Trenton Road. Faculty, staff, and students will be available to provide information about Mercer’s 70 degree programs and 30 certificate programs in areas that include the health professions, manufacturing technology, culinary arts, business, engineering, liberal arts, and entertainment technology. Participants will also learn about some of Mercer’s more unique degree programs, such as Aviation Flight Technology, Security Systems Technology, Horticulture, Funeral Services, Fashion Design, and Fashion Merchandising. 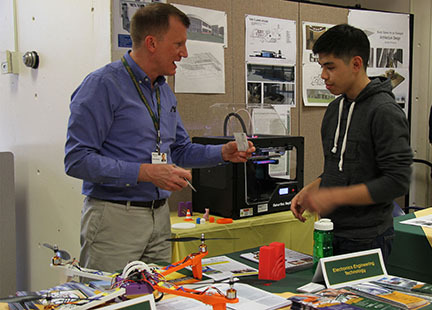 MCCC Engineering instructor Harry Bittner discusses the uses and application of 3-D printer technology during an open house at Mercer County Community College. Information will be available about the Trenton and West Windsor campuses, MercerOnline, and American Honors at Mercer, as well as transfer and dual admission programs and bachelor’s degree programs on campus through partnerships with four-year colleges. Visitors can learn about financial aid, special services, and NJSTARS, a state program providing free tuition for qualifying high school graduates.